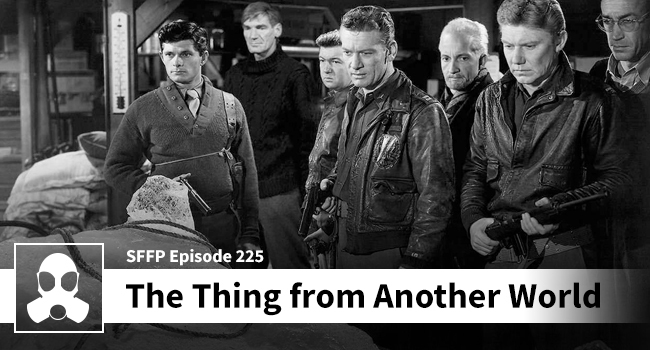 This week the lads go back to 1951 complete with static camera shots, Trans-Atlantic accents, lots of cigarette smoking, and good ole’ fashioned horror. This is the movie that inspired John Carpenter, but does it stand the test of time? Is this a flick that someone will like if they watch it for the first time in 2017? You’re in luck – Dean hasn’t seen this movie before covering it for the podcast. Matthew grew up with the flick, but has his opinion changed over time? Step in out of the cold and join us in the Officer’s Club, and you will have all of the answers you’re looking for!